Regular tour availability: Fridays 14:15pm and Sundays 9:00am March to November. Private tour availability: Tiesday, Wednesday and Friday 14:15pm or Sundays 9:00am March to November. Leaving Barcelona behind you, travel in a luxury mini-coach with full air conditioning to the the wine-growing region of Spain, El Penedès, home to several prestigious vineyards -known locally as “cellers”. 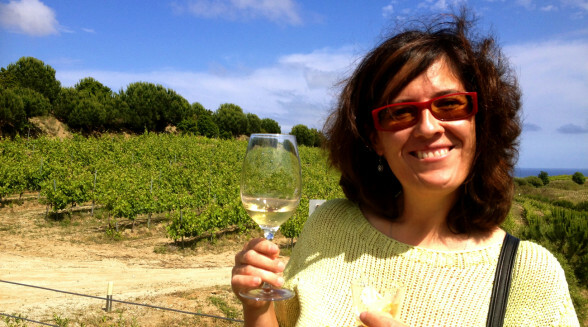 Learn all about Cava, a high-quality sparkling wine, as you visit a family owned winery in Spain. Learn how the famous wine and cava (local champagne) are produced, from the first pressing of the grapes to the fermentation in the cellars. After touring the vineyards and cellars, take part in a cava-tasting session, savoring the exquisite notes of the local champagne. 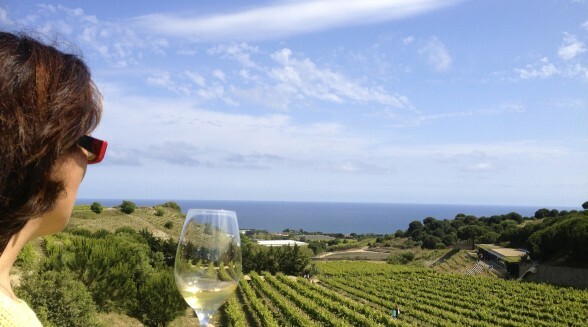 You will see exactly why Catalan wine and cava have acquired such international fame. Continue the tour to experience a local festival. Spain, and specially Catalunya, is the land of traditions. In every single city, town and village there is a festival of some kind which gets all the townsfolk out in the street to celebrate. 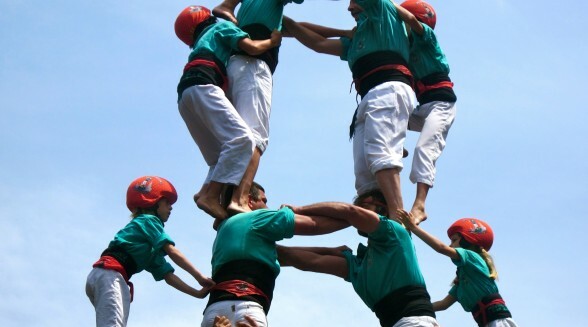 The most popular element in a city festival is ‘Castellers” or Human Tower Builders, who build up their best human towers in this special celebrations. This is an opportunity for the community to gather, to participate and to celebrate a shared heritage. 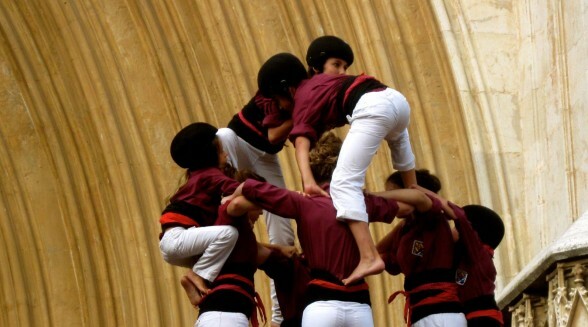 Castells (or human towers) have existed for over two hundred years and today it is still the liveliest popular expression of Catalan culture. This is a unique practice in the world and UNESCO has declared it Intangible World Heritage. 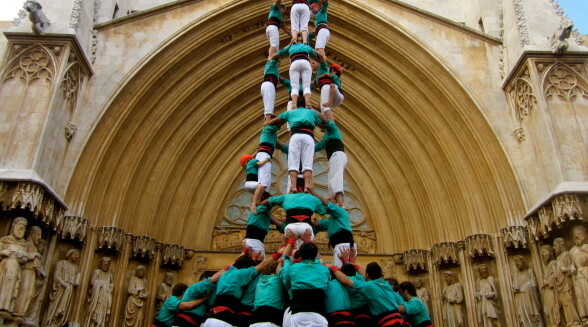 Human towers can be up to 10-people high. 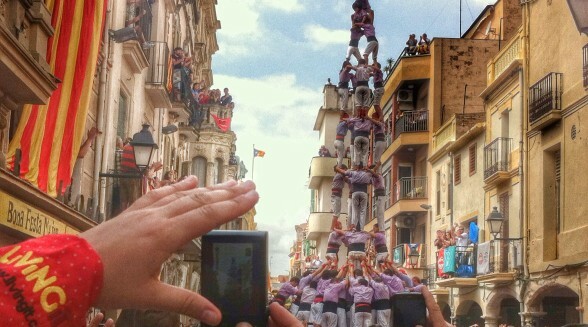 Hundreds of Catalans of all ages take part, from 60-year-old veterans that help to form “la pinya” (the solid base of the tower), to the brave “anxaneta” (a child of no more than six years old) who crowns the tower. Learn how important is courage, teamwork, spirit of improvement, self-esteem and teammates confidence in this traditional activity. Later on, you can have a go yourself! Entirely optional, the instructor will help you to form part of la “pinya” – the solid human base of the tower. This tour is available every Friday at 14:15 and every Sunday at 9:00h, from March to November. The meeting point is at Plaça Ossa Menor (in the Glories Shopping center), which is easily accessed from the entrance located in Diagonal Avenue. We meet next to McDonalds. We can also pick you up at your accommodation place. Tell us when you book in! Lo pasamos en grande y nuestro guía, Joan Sahun fue espectacular. 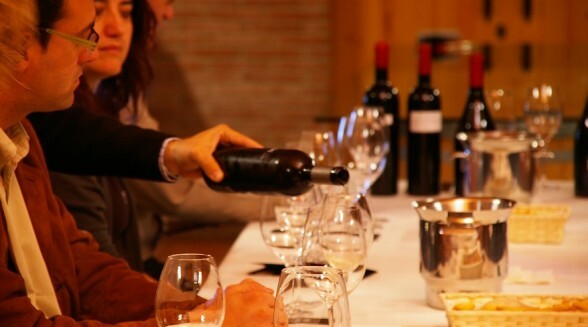 Se preocupó de que estuvieramos disfrutando en cada momento de la actividad y nos dió mucha información interesante de vinos y cultura de Cataluña. Se merece un 10!! Un placer haber compartido esta experiencia con vosotros. Barbara, our guide, was knowledgeable and entertaining. And the following morning, Barbara send us all pictures of the vineyards and the human towers. Amazing moments! If we return to Barcelona, we’ll definitely book another tour with LIVING IT! My husband Steve and I had an AMAZING tour with Paul of the Castelliers last Saturday night!! We are still remembering our wonderful experience and will treasure the memory always. It was a highlight of our trip! Barbara we missed meeting you, but were thrilled with the incredible tour we had with Paul. Congratulations on the upcoming birth of your baby. We will definitely recommend Living It to our friends who will be traveling to Barcelona this fall. Gracias a todos por cuidar de nuestros chicos tan bien. “Te confirmo la recepción de las fotos y que están muy bien! Aprovecho para decirte que nosotros también estamos muy contentos con el resultado de los dos primeros eventos, queremos agradeceros vuestro trabajo que no ha sido fácil para que todo saliese como salió. La naviera y los cruceristas también están muy contentos y en vista está que los ratings de ambos eventos están por encima de 3.80 sobre un total de 4”. “Ya tenemos primeros comentarios del barco, les ha encantado todo y, mas del todo, el contenido del evento. Muchísimas gracias a vosotros por organizar todo y tan bien”. The tour was very personalised. Joan met us at the agreed destination. There was only 3 people as part of the tour. 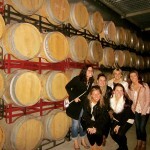 The winery was wonderful, a family owned experience with beautiful wines. 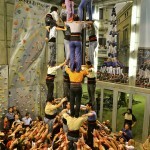 The human tower was seen during the training sessions. It gave us a feel for the event and can only imagine what the atmosphere would be like during the festival. At the end of the day, Joan dropped us off at our hotel. Highly recommended. Mil gracias- qué maravilla. Qué 4 de julio más especial compartieron con la Colla de Santa Coloma de Gramenet! Mil gracias por la experiencia inolvidable que habéis organizado! 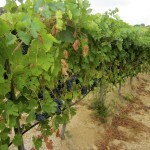 The day was a terrific local experience with great food, wine and a very special guide. The last part of the tour: the human tower display was exceptional! We met several human tower builders and they explained us how to do it and we could also take part of the tower. We felt like if we were catalonians! Thank you Barbara for such a great evening! If you are in Barcelona, you must give this a try! I would not hesitate to book with LIVING IT tours again!